We have teamed up with Fruit of the loom and result clothing to get the special price to our customers. Promotional clothing is a great way to promote your company or message. Anywhere where company employees are seen they should be wearing promotional clothing with your company name or logo. Promotional clothes are a great way to promote your company. Promotional wear can be worn by company employees to ensure a professional and consistent image. Remember “you never get a second chance to create a good first impression”. View our personalised, embroidered and printed t-shirts. Promotional clothing is a long lasting low cost means of advertising your company. Whether promotional clothes are worn by your employees or given a way as promotional merchandise, your company name will be in the public eye for years. View our personalised, embroidered and printed polo shirts. We offer a wide range of quality promotional clothing, including t-shirts, polo shirts and fleeces, all of which can be personalised with your logo or message. 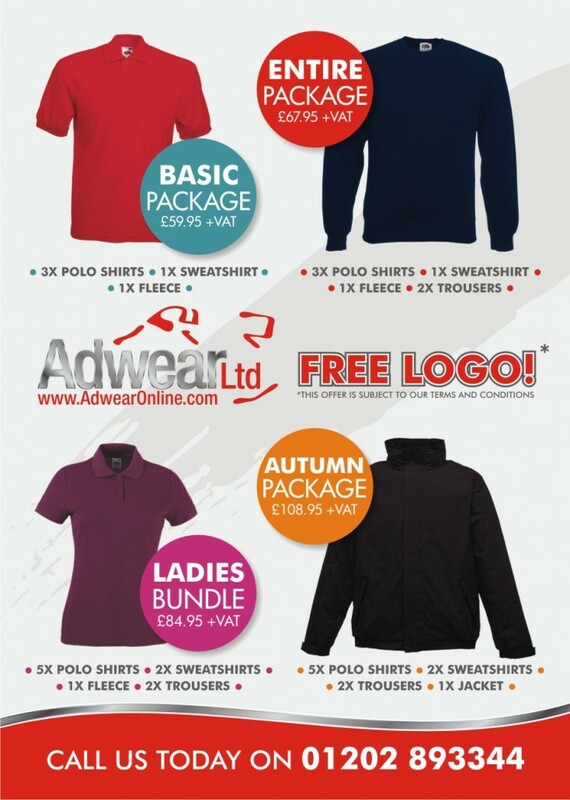 With Adwearonline.com there is no 2 week delay to receive your promotional merchandise. We are the first promotional wear company to be able to do this. We offer total convenience, check products and prices online. Upload your logo or text and order your promotional clothes. We do the rest. Your order will be sent to you by courier and you can track the progress of your promotional merchandise order online. We offer total products from leading manufacturers including Henbury, Kustom Kit and Fruit of the Loom. If you need help with ordering your promotional clothes, we are only a phone call or click away.